1) Defending with two banks of four. They defended in 4-4-2 basic shape or even a 4-6-0 strikerless one. 2) Condensing the central area and “let” the opponent play around and outside the box. When the opponent enter the dangerous zone, Atletico will press them immediately. Or, when the opponent are on touchline/wide area, Atletico would press them there. They would create 2v1 or 3v1 pressing situation. Atletico touchline pressing, scheme one. (translation) Arda Turan, the right winger, dropped deep to press the left back (Marcelo), Juanfran kept his eyes to the left winger (Ronaldo). Gabi (one of CM), acted as the support and helped creating 3v2 situation. Atletico touchline pressing, scheme two. (translation), Atletico kept their 4 men behind shape remained compact. The difference, in this moment, was, this flat d-line, was covered by additional one player on each of its wide area. Arda Turan (on the right) and Suaréz (on the left). Arda swapped position with Juanfran and kept “the 4 men behind” shape remained narrow. On the left wide area, Suarez and Koke acted as the main presser and pressed Benzema, while Siqueira (the left back), acted as the support. This scheme two, is actually a good shape if a team are about to keep their defenders stay on their respective defensive positions. Because, when they should deal with an attack from the flank, the players to put pressure are not the defenders. The 4 defenders (in 4 men behind shape) can stay on their position, keep the shape remain compact, and condense the central area. The wingers or one of CM are the players to act as the main presser. If one of these four intends to help build a pressing formation, he can act as the support (cover). 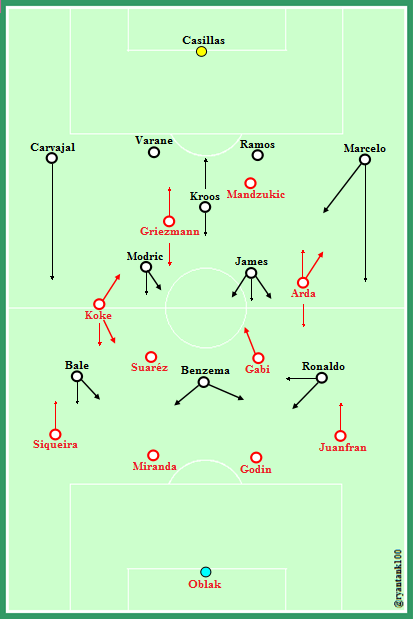 As an attacking-based side, who rely on their wide areas as one of their main weapon, Madrid seemed to be getting difficult, as Atletico pressed heavily on the wide areas. But, it didn’t mean Real Madrid “died” due to such pressure. As the respon to such intense play, Madrid created some overloading scheme, which, in some occasions, with the proper timing, Madrid managed to recover. This was one of them. Madrid pressing on the right side. Madrid created 3v2 situation. Juanfran decided to pass the ball to the advance area to Mandzukic. But, Ramos, who had read this, managed to intercept it. This 3v2 situstion press, in turn, lead the ball t Luka Modric, who was brilliant throughout the match. From Modric and his partnership with Kroos, Madrid would then decide where to spread the ball. Modric released 73 passes, highest in match. 7 of them were the long passes. He played well as a number 8, being the integral part of Madrid playing scheme in central midfield. One interesting combination of Real Madrid, was, the combination between Karim Benzema and Marcelo. Once again, Benzema showed his capability of lateral movement. He is known to be good at that. Benzema moved laterally to the wide. Marcelo occupied the half space. In the right timing, Benzema gave the ball to Marcelo who tried to get through the channel. There was the possibility, that, this was one of Ancelotti attacking scheme. But, as there was very little chance of that, Madrid was forced to try with another alternative of play. One of the best moment of madrid wide area play, was the moment of 29th minute. Benzema combination with James, Marcelo, and Ronaldo, before switched the play to the opposite flank. “… In the first half we did that, with great work. It is difficult to say [bad finishing was to blame]. These are small details. We were very good in attack, with good movement, even if we did not finish so well…” ancelotti post match interview. This example of wide area play, was one of the right example of Ancelotti’s statement. Karim Benzema. One of Benzema strength. Lateral movement in his role as a false nine. The other interesting thing to see from this moment, was not only Benzema capability of lateral movement. But, the simple off the ball movement by James Rodriguez that managed to drag Juanfran (Atleti’s right back) and avoided him bothering Benzema. Had it not James initiated such movement, there was huge possibility Juanfran might press Benzema and stopped this scheme of play. But, that’s not hapened, as James made a good off the ball movement and positively-impacted to the Benzema movement. Atletico themselves opted to play direct football. In many occasions their attack was generated by making long ball passing right from behind to the advance area, to the attacking line. But, it was not too effective, as Mandzukic was not in his form. He lost the one on one duels in many occasions. Madrid were helped with this. It became easier to read and stop Atletico attack. Aside from their direct style, Simeone seemed to give more license for his players when on attacking phase. Atletico attacking play was more “free” than their defensive structure. If you saw the likes of Arda Turan and Antoine Griezmann tried to run with ball, that was one of the “freedom” I mentioned before. Particularly Arda Turan, he is like a creative free role one in this rigid system of play. But, with that direct play and the “free role” player, it doesn’t mean there is no planned attacking-scheme in Simeone tactical vision. As he does in defensive scheme, Simeone always tries to play in a narrow shape. He will be happy to ask his boys to keep their distance as close as possible. Atletico attacking build up. A good shape, in terms of ball possession. Diamond formation, another Atletico build up play. In the second half, not much change was made by these two managers. Both offensively and defensively. Identical approach was made compared to the first half play. 3 v 3 situation in attacking scheme. Like what they did in the first half, Madrid still tried to build their play from wide area. And, Benzema, was the integral part of this scheme, as he would move wide and built the play or opened space. Ball circulation was ended with a float cross released by Luka Modric, to the penalty area. The same approach was taken by Atletico. In many occasions, Atletico created such situation and they repeatedly managed to counter attack or (just) find the way through Madrid pressing formation. Atletico condensed the central area and made it hard for Real madrid to get through the central area. Forcing Madrid to make a lot of crossings, which was not effective. Real Madrid also tried to open the space through their flank to flank play. This actually was intended to open the horizontal gap in Atletico formation, but, Atletico, as aforementioned, was able to play their defensive plan properly. In the second leg, if Tiago is played, it may positively impact to Atletico. Tiago is a player with good tactical understanding, he also has better playmaking ability than Mario Suaréz. If he’s fit, it will be a good choice to pick him into the starting eleven. Real Madrid will need to repeat their first half play, with the improvement on its finishing touch, for sure. This entry was posted in tactic and tagged Atletico Madrid, Carlo Ancelotti, Champions League, Diego Simeone, Pressing, Real Madrid. Bookmark the permalink.